Happy Friday to you, hope your weeks been a good one. I'd like to send a huge thank you to Lyn Jones and Karen Richards for making some gorgeous samples for the Graphic 45 show this morning on Create and Craft. When I unpack the show boxes I'll take some pictures of them all and share them with you. Thank you so much both. Graphic 45 are sharing some out of the box Botanical Tea ideas by Denise and myself over on their blog today. If you fancy making some altered eggs yourself there's also a short step by step guide on how to make them. To visit the blog click here. You were wonderful today Claire. Did not get a chance to Email in as I was working at the same time (work from home so can watch and work at the same time!!). I bought these two pads a month ago at AFTH and just love them. Very pretty as always Clare!!! I have several plastic eggs in different colors, think I will give them all a base coat of off white and then stamp tissue paper and give them a go myself!!! Thanks for sharing. OOO! Cool! Thank you for the idea. Morning Clare, Your shows yesterday were fabulous, I loved the G45 show and I wasn't expecting seeing you doing the DCWV, which was a lovely surprise. 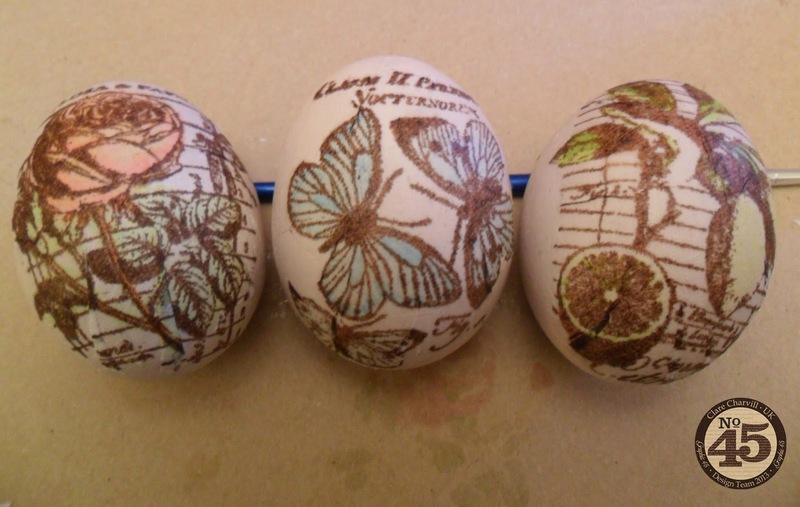 I have just seen these fabulous eggs over on G45 Blog, they are stunning Clare, I would never have thought to do this, thank you for the step-by-step, I will be trying this out, gorgeous colouring too. Have a lovely weekend, hope it isn't too hectic for you. Morning Clare, these are amazing! Fabulous idea too. Great shows yesterday too. Gosh! These are amazing and put my onion skin died eggs to shame. Where do you get all of your energy from Claire? Take care this weekend and have fun. Trying to remember how to make the spine of a book which you showed us at Suzicraft in Sept. I'm getting there!! Hugs Pauline A x. Those eggs are beautiful - love em.